New Delhi, Aug 27 : Leader of Opposition in the Rajya Sabha, Arun Jaitley on Saturday supported the major demands made by civil society activist Anna Hazare, but said that the appointment of the Lokayukta for the states must not be made by the central government, but by the state governments. New Delhi, Aug 27 : The massive support for Anna Hazare is a "loud and clear" message that people are unhappy with the present dispensation, opposition leader Arun Jaitley said Saturday. As the Rajya Sabha took up the debate on the Lokpal bill, Jaitley said: "The message is loud and clear, people are not ready to accept the present status quo. "Corruption in many areas has become a way of life." New Delhi, Dec 29 : The Delhi and Districts Cricket Association (DDCA) President Arun Jaitley has responded strongly to the blame put up by former cricketer Kirti Azad that he was manhandled in the DDCA meeting that was called to discuss Sunday''s one-day international fiasco. 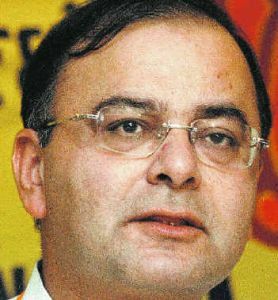 Jaitley said, "No event like the one described by Azad took place in the DDCA meeting." Azad had earlier claimed that he was allegedly attacked for asking questions related to the issue. New Delhi, Dec 25 : Reacting sharply to the prime minister's working group suggestion of considering autonomy to Jammu and Kashmir, Bharatiya Janata Party's (BJP) Arun Jaitley, who was a member of the panel, Friday said he was not consulted before finalising the recommendation. Jaitley has written a letter to Prime Minister Manmohan Singh complaining that the recommendations of the fifth working group on centre-state ties were a farce. The group, headed by Justice (retd) Saghir Ahmed submitted its report to Chief Minister Omar Abdullah Wednesday. New Delhi, Dec 22 - The government was in a "Sharm-el-Sheikh syndrome" as far as the climate change accord in Copenhagen was concerned, Bharatiya Janata Party (BJP) MP Arun Jaitley said Tuesday while labelling the document a "betrayal of poor nations". New Delhi, Dec 9 : The Liberhan Commission report on the Babri Masjid demolition was a "national joke", Bharatiya Janata Party (BJP) leader Arun Jaitley said Wednesday and wondered if it had been outsourced to some other people to be written. "The report is devoid of any credibility. It is an unimplementable document and a fraud on fact finding process. It is a national joke," Jaitley said in Rajya Sabha. "It was not a fact finding mission but a commission which commented on ideology," added Jaitley, who is Leader of Opposition in the Rajya Sabha. New Delhi, Aug 24 : Delhi and District Cricket Association (DDCA) President Arun Jaitley has assured star player Virender Sehwag of fair and performance based selection in the Delhi Ranji team. Jaitely’s assurance came during his meeting with Sehwag thus ending the players revolt. According to sources, the meeting has resolved all the issues raised by the players. Jaitley also promised Sehwag to review the role of the dubious selection committee. Shimla, Aug. 20 : Senior BJP leader Arun Jaitley on Thursday denied existence or the tabling of any internal report prepared by Bal Apte at the three-day Chintan Baithak (brainstorming session) on reasons for the party’s debacle in this year’s general election. He also justified the expulsion of Jaswant Singh from the party. Disappointed over Union Telecom Minister A Raja's reply to the debate on the functioning of his ministry, the Opposition parties led by BJP on Monday staged a walkout from the Rajya Sabha and insisted a joint parliamentary committee probe into the spectrum allotment. However, Raja claimed that the allotment was done through the prescribed process. Speaking in the Upper House, Raja said: "Nothing has been done clandestinely or surreptitiously. I maintain it is most transparent." New Delhi, July 17 : Leader of the Opposition in the Rajya Sabha Arun Jaitley said the Indo - Pak joint statement issued at Sharam - el - Sheikh in Egypt was disappointing and a reversal of India's long standing policy. Raising the issue during Zero Hour, Jaitley said the joint statement stating "action on terrorism should not be linked to the composite duologue process and these should not be bracketed" has come as a surprise and also disappointment. New Delhi, June 16 : Senior Bharatiya Janata Party (BJP) leader Arun Jaitley on Tuesday resigned from the post of General Secretary. Party President Rajnath Singh confirmed the news. New Delhi, June 3 : The Bharatiya Janata Party on Wednesday appointed senior leader Arun Jaitley as the Leader of the Opposition in the Rajya Sabha and Sushma Swaraj Deputy Leader of the Opposition in the Lok Sabha. S S Ahluwalia has been appointed as deputy to Jaitley in the Rajya Sabha. The responsibility to choose leaders for these posts was given to veteran leader of the party, L. K Advani, who has been elected as the Leader of the opposition in Lok Sabha. New Delhi, May 16 : Accepting the people's mandate on the 2009 General Elections, Bharatiya Janata Party (BJP) General Secretary Arun Jaitley on Saturday said that his party had got less seats than expected. "Things definitely went wrong for us. The BJP accepts the people's verdict. We have got less seats than we expected," Jaitley said at a press conference here. Jaitley admitted that the Congress has emerged as the largest political party and was the nearest to form the next government at the Centre. Varanasi/ Ranchi/Patna, Apr 8 : Senior Bharatiya Janata Party (BJP) leader Arun Jaitley alleged that the Election Commission practises double standards. "We expect the Election Commission not to practice double standards. The advice which the Election Commission gave to BJP on Varun Gandhi should be given to RJD and the UPA on Lalu Prasad," said Jaitley in Varanasi. He was reacting to Rashtriya Janata Dal (RJD) chief Lalu Prasad''s statement that he would have ''crushed'' Varun under a road roller for his anti-Muslim speeches, had he been the Home Minister. New Delhi, Mar 19 : After skipping two key party meetings to express his displeasure over the appointment of Sudhanshu Mittal as party co-convenor for the North East, Bharatiya Janata Party (BJP) leader Arun Jaitley on Thursday met party President Rajnath Singh. According to reports, Jaitley went to the Singh's residence here and stayed there for about an hour. The BJP General Secretary is the party's in-charge for Bihar and Delhi and the name of candidates for these two states could not be finalised as he had skipped the Central Election Committee meeting twice. New Delhi, Mar 14 : After skipping a key party meeting on Friday to express his displeasure over an appointment, the Bharatiya Janata Party (BJP) General Secretary Arun Jaitley on Saturday attended an event at the party headquarters here. The BJP president Rajnath Singh and party's Prime Ministerial candidate L. K. Advani were also present at the event. 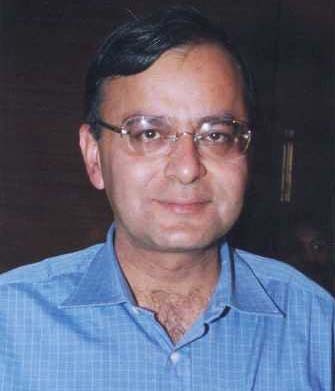 Jaitley was disappointed over the appointment of Sudhanshu Mittal as co-convener of North-East affairs. Union Home Minister has called an important meeting of all Chief Ministers in New Delhi due to the increasing importance of security in the country. During the meeting the decision was made to get serious with the Government's moves without coming across as being politically incorrect. BJP general secretary Arun Jaitley said, "We have a deep concern over the vulnerable internal security situation in the country - the incidents in Assam, the continuing encounters in Poonch." Jammu Dec. 10 ; Senior Bharatiya Janata Party leader Arun Jaitely today said that Pakistan is trying to befool the world community by living in a world of denial. Speaking to reporters here ahead of the fifth round of elections in Jammu and Kashmir, Jaitely said: “When the world is watching that such a big terror attack has been carried out on the behest of Pakistani establishment, which is evident from the equipment they used and the rigorous training they have gone through, this clearly indicates that without the help of Pakistan, it is impossible. The Election Commission of India issued notice to senior Bharatiya Janata Party (BJP) leader Arun Jaitley for violating the model code of conduct. It was alleged that Jaitely used his official pad bearing the national emblem to appeal to people to vote for a BJP candidate fighting elections from Delhi. The Commission has called for an explanation and asked action should not be taken against him. Jaitley was issued the notice under section 123(3) of the Representation of the People Act, 1951 that does not allow the use of the national emblem, national flag or religious symbols in electioneering.